The small ledge where Diamond Lake and Lady Evelyn Lake meet is Temagami's second busiest portage after Sharp Rock. 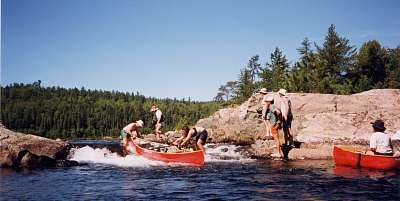 During the peak of summer, a canoe group every ten minutes goes through. Then again, maybe it should be called a portage-liftover-line-run because the means of crossing between these two lakes has changed over time. If it had a voice it could tell tales of the changes it has witnessed. 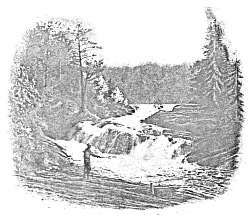 Prior to 1916, a 265-yard (220-meter) portage was necessary to get around the falls and rapids, then known as Lady Evelyn (or sometimes Diamond) Falls. The ca. 1915 construction of a dam (whose original builder remains a mystery) at Matawapika (or Matawabika) Falls where Lady Evelyn Lake and Montreal River meet today, raised Lady Evelyn Lake somewhat. But the 1925 increase in the height of the dam did massive flooding, including the river that had connected Lady Evelyn and Diamond lakes. Only the small upper lip of the falls remained. It was on a trade route for First Nations traveling locally and between the Montreal River, Temagami and Lake Nipissing. But it was also near the geographic center of the Teme-Augama homeland. Diamond Lake had a small native settlement and, in the late 1800s, a Hudson's Bay Company post. 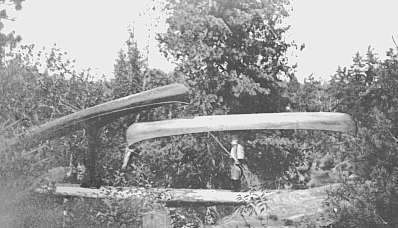 The Teme-Augama probably built the log bridge (shown in the 1894 photo) on the portage (no longer in use), which was south of today's liftover. After the flooding of Lady Evelyn, the portage trail fell out of use as travel between the lakes was reduced to lifting over, lining or running. Lifting over usually refers to moving fully loaded canoes upright over a short portage or obstacle. A liftover can also be a portage as short as 25 yards. The photos below show how short the distance between the lakes had become. In 1942, A.J. Murphy Lumber Company constructed a dam (shown above) to float logs from its Diamond Lake operations down to Lady Evelyn Lake and then to its mill at Latchford on the Montreal River. A. B. Gordon and Company also floated logs through here to its Latchford mill from its Lake Temagami limits in the period 1950 to 1956. Logging use of the dam ended about 1960. The dam changed things. It raised the level of Diamond Lake, flooding shoreline, part of the large native rock art site and the homes of Teme-Augama Anishnabai without their consent. Canoes could no longer take the channel but had to lift over. But there were those who chanced the foaming chute in the dam in 1950s, when it was clear of logs. Carl Schneider Sr., a former camper and staff at Keewaydin recalled: "It was an easy run as long as you missed the log spike that was on the middle, left-hand side of the chute. If you hit it, you would pay the price with damaged canvas, sheeting, and ribs. You would hang up for an instant, pop free, and bail your canoe out until you got to shore and fixed the rip with Ambroid, sail canvas, and the tops from tin cans to repair the sheeting." "We also would run across log booms on Lady Evelyn and Diamond Lake. It was good fun to try to burl the logs, try to run on top of the logs, and generally try to play lumber jack. You usually ended up in the lake, but back then, that was fun." In the fall 1973, MNR dynamited the dam, at the request of the Temagami First Nation over concern for water and ice damage to the ancient rock art site. The receding water left a wide forest-free shoreline on much of the eastern portion of the lake. Rusting log- boom chains and anchors on both sides of the liftover are testament to the logging era. When there is enough water, canoes can now be floated over the ledge again.